In soup recipes of Elizabeth David's French Provincial Cooking, the reader is often instructed to sieve to puree food multiple times with increasingly finer mesh. I suspect that such a sieve is rare these days even in UK or US. In such instances, I always use a blender instead. But, I'm not sure this is a right way to do this. Is one of the purposes of sieving to remove coarse particles ? What is the modern way to do this ? The modern way is still to sieve. I actually did this a couple of days ago. I made a sauce out of boiled onions, capiscums, chilli peppers, canned plum tomatoes, carrots, garlic, ginger and spices. This was then whizzed in a blender and sieved through a fine metal sieve to remove the pulp, seeds, large fibrous pieces that wern't blended. It makes for a smoother sauce. The fine metal sieves are fairly cheap and easy to obtain. 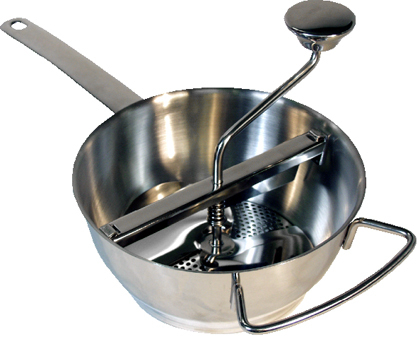 There are also finer sieves made from plastic or even muslin you can also use. The technical term seems to be chinois. Not the answer you're looking for? Browse other questions tagged equipment soup resources or ask your own question. Where can I find complex recipes?